In the last blog I went through some of the new functionality with the Outline Load Utility and today I am going to continue and go through loading data from a relational source. I am not going to cover any of the properties again so if you have not done so it is probably worth having a read of the last blog. Loading data through the planning layer is great if you want to load text, Smart List and date data, if loading numeric data then personally I would stick to loading direct to essbase as it is much more efficient and has a lot of additional functionality. In an earlier blog I went through the process of loading text data from a flat file using the Outline Load utility and to be honest the concept is nearly identical for loading from a relational source. Anyway no need for anymore waffle so let’s get on with the process. In my example I have created simple form to show employee information by entity and instead of entering the information manually I am going to load it from a relational table. 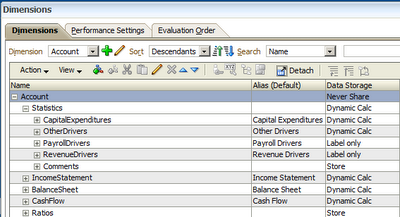 The evaluation order has been set in planning so the correct data types are displayed in the form. The source data is by entity, year and account, the rest of the data is static so can be fixed when writing the query to load to the planning application. 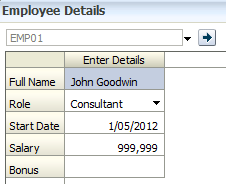 In my example the data load dimension will be the entity dimension and the driver dimension will be Account with the members “Full Name”, “Role”, “Start Date”, “Salary” and “Bonus”. You can still use the data load settings method for loading from a relational source or use a new parameter /SDM which allows the information to be set from command line or using a property file. 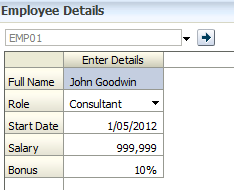 This sets the data load dimension as Entity and the driver members as “Full Name”, “Role”, “Start Date”, “Salary”, “Bonus” and the third property is the plan type to apply these to. Besides the data load dimension and driver members the “Point-of-View” and “Data Load Cube Name” also need to be provided in the relational query. The “Point-of-View” is a comma separated list of all the remaining dimension members in the plan type and this is required so the intersection on where to load the data to is fully defined. The “Data Load Cube Name” is pretty obvious and is the plan type/essbase database name to load the data to which in my case is “Consol”. A simple SQL query can be created to return the data in the correct format though it is worth noting the column names have to match the properties required for planning. The query can be added to the command line or to a properties file which I will be using. I covered most of the properties in the last blog so hopefully they should all make sense. Now all that is left is to run the utility from command line passing in the required parameters. In my example I only required the password file and the property file as all the parameters were set in the property file. [Sun Sep 30 15:56:38 BST 2012]Setting Driver Members as specified with the /SDM switch. A query was located in the Command Properties File "E:\PLAN_SCRIPTS\dataload.properties" that corresponded to the key passed on the Input Query switch (/RIQ) "DATA_SQL" so it's corresponding value will be executed as a query: "SELECT Entity, full_name as "Full Name",role,to_char(start_date, 'dd-mm-yyyy') as "Start Date",Salary,Bonus/100 as "Bonus", 'FY' || substr(Year,3,2) || ',Actual,Working,Local,Ignore,BegBalance' as "Point-of-View",'Consol' as "Data Load Cube Name" FROM PLANDATA"
Source RDB "FUSION_CONN" on jdbc:oracle:thin:@[fusion11]:1521:FUSION connected to successfully. Connection to input RDB made successfully. [Sun Sep 30 15:56:38 BST 2012]Date format pattern "DD-MM-YYYY" specified for date data type loading. [Sun Sep 30 15:56:38 BST 2012]Located and using "Entity" dimension for loading data in "PLANDEMO" application. [Sun Sep 30 15:56:39 BST 2012]Load dimension "Entity" has been unlocked successfully. [Sun Sep 30 15:56:39 BST 2012]A cube refresh operation will not be performed. [Sun Sep 30 15:56:39 BST 2012]Create security filters operation will not be performed. [Sun Sep 30 15:56:39 BST 2012]Examine the Essbase log files for status if Essbase data was loaded. [Sun Sep 30 15:56:39 BST 2012]Planning Outline data store load process finished. 2 data records were read, 2 data records were processed, 2 were accepted for loading (verify actual load with Essbase log files), 0 were rejected. No errors were generated in the log and all records loaded successfully. Running the form again confirmed that all the data has been loaded in the correct format. 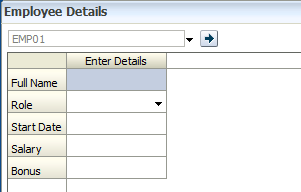 This allows you to define an intersection in the essbase database to clear before the data is imported, this functionality has been included because the utility does not currently load #missing values and if values already exist they will not be overwritten. So say the same data was loaded again but this time there was no Bonus data. The format for the ICB parameter is similar to how the data is loaded so it requires the data load dimension member, the driver members, the point of view and the data load cube name. The /ICB values that I have used will clear out all the data in the form before it is loaded. As the data is now cleared before the import this time the Bonus member contains the correct data. 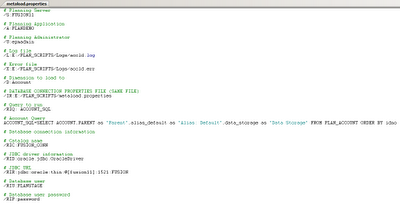 From examining the essbase application log you will be able to view the clear data command that has been executed. Well that about covers loading data from a relational source, there is one more new piece of functionality with the Outline Load utility and that is extracting data to a csv file which I will try and go over whenever I find the time. I noticed that the recent patch release of planning 11.1.2.2.300 includes some additional functionality for the outline load utility that is worth going through. It is a utility that I know has made consultants lives much easier, it is simple to use and is now packed with functionality. Optimize command lines by storing command line arguments in a command properties file. For example, if you use a command properties file to run the same commands on multiple applications, you need only change a parameter in the command line for each import. This allows you to bundle switches for a common application. It also makes command lines shorter and easier to manage, and enhances readability and ease of use. If you are going to patch planning then make sure you go through the readme in detail as it can be quite painful if you are on a distributed environment and it also requires patching other products first plus additional ADF patching. Today I am going to go through using the properties file and importing metadata from a relational source, in the next blog I will cover the remaining enhancements. In previous versions of Hyperion before the days of the Shared Services registry most of the configuration settings were held in properties file, a properties file (.properties) basically allows you to store key-value pairs which are separated either with a colon (key:value) or an equals sign (Key=value) and these pairs are then read by the calling application. You are not restricted to only using pairs in the file as the other parameter switches can be used as well such as /N /O /C etc. Before this release all of the these parameters had to be included in the command line and depending on the number of parameters it could look messy and if you have many scripts a lot of replication was being exercised. Instead of having to write this information to the command line it is read from the easier to read and manageable properties file. It is also possible to override the values in the properties file by including them in the command line. /D:Entity which defines the entity dimension to load to takes precedence over /D:Account in the properties file. I did notice that it doesn’t look possible to include -f:passwordFile parameter in the properties file and had to be included in the command line. Right on to the main event and loading metadata into a planning application from a relational source, I know this new functionality will be music to the ears for lots of consultants because in many cases the source can be relational and up to now a SQL download and formatted file would have to be produced before using the utility. There a quite a lot of new parameters available for the relational functionality and I will cover the ones that you are likely to use when loading metadata. 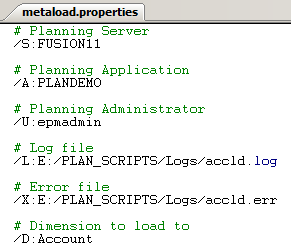 Here is an extension to above metaload.properties file which includes the parameters to run a SQL query against a relational source to load metadata to a planning application. This will read metaload.properties for the source relational database information. 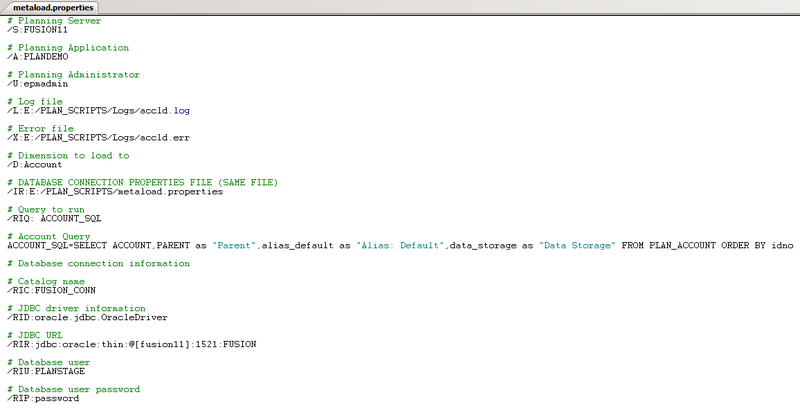 This can either the SQL query to be run or it can be used to designate a key which will hold the query. You may be asking why not just put the SQL directly in the /RIQ value, well you may have multiple SQL statements for different metadata load and by just updating /RIQ you call the required one, if you use /RIQ in the command line and have all the keys in the properties file then it is simple call different queries and looks much tidier. The query must return column header names to exactly match the properties required for planning. For Oracle I don't believe it matters what you specify as the value, for SQL Server it should be the database name. The parameter is the JDBC driver that will be used for the connection to the relational database. 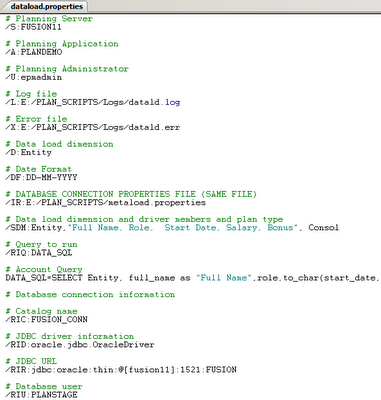 The parameter is the JDBC URL to be used for the connection to the relational database. Nice and simple this is the user name to connect to the relational database. The password for the database connection, this is unencrypted the first time it is used in a properties file. Once the outline load utility has been run it will update the properties file and encrypt the password. If you don’t want to use a properties file then all these parameters can be entered directly into the command line. The Account dimension currently contains no members. The outline load utility is executed passing in the parameters to the encrypted password file and the properties file to use. The utility reads the properties file and checks whether the database connection password is encrypted and as it is not encrypted it updates the file with an encrypted value. The utility reads through the rest of the properties and then merges them with the ones currently in the command line before submitting them. The output in the log provides further detailed information. A query was located in the Command Properties File "E:\PLAN_SCRIPTS\metaload.properties" that corresponded to the key passed on the Input Query switch (/RIQ) "ACCOUNT_SQL" so it's corresponding value will be executed as a query: "SELECT ACCOUNT,PARENT as "Parent",alias_default as "Alias: Default",data_storage as "Data Storage" FROM PLAN_ACCOUNT ORDER BY idno"
[Mon Sep 17 22:24:26 BST 2012]Located and using "Account" dimension for loading data in "PLANDEMO" application. [Mon Sep 17 22:24:26 BST 2012]Load dimension "Account" has been unlocked successfully. [Mon Sep 17 22:24:26 BST 2012]A cube refresh operation will not be performed. [Mon Sep 17 22:24:26 BST 2012]Create security filters operation will not be performed. [Mon Sep 17 22:24:26 BST 2012]Examine the Essbase log files for status if Essbase data was loaded. [Mon Sep 17 22:24:26 BST 2012]Planning Outline data store load process finished. 317 data records were read, 317 data records were processed, 317 were accepted for loading (verify actual load with Essbase log files), 0 were rejected. All the 317 data records were read, processed and loaded successfully to the planning application. Back in the planning application you can see all the metadata has been loaded. 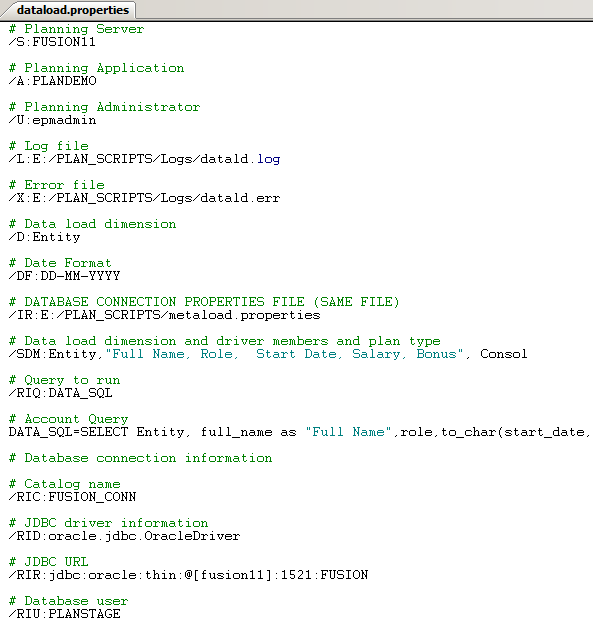 There is one more parameter that I have not mentioned and that is /IRA, if this is used then the database connection information to the connected planning application is used. This allows queries to be run against tables in the connected planning application database and does not require the /RIQ, /RIC, /RID, /RIR, /RIU, /RIP parameters. Using the new functionality will also allow you to query the planning tables directly to return metadata, if this is something you are looking to do then it is definitely worth having a look at the Cameron Lackpour’s blog as he has kindly spent quite a lot of time covering this area in a number of his posts. In the next blog I will cover the rest of the new functionality.